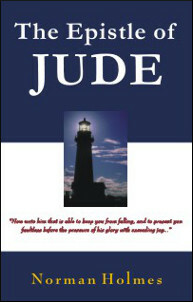 In his book on the Epistle of Jude, Rev. Holmes presents us with a beautiful exposition on this letter of the brother of our Lord Jesus to the early church. It will encourage us to strengthen our faith so that we can recognize and avoid the snares of the enemy and walk in confidence with the One who loves us and is able to present us faultless before His throne with great joy! Rev. Norman Holmes is a musician, worship leader, teacher, and missionary who has led teaching and worship seminars in many nations. He also directs several Bible schools, conducts pastor’s seminars, and has written six books that are being used around the world in many languages.